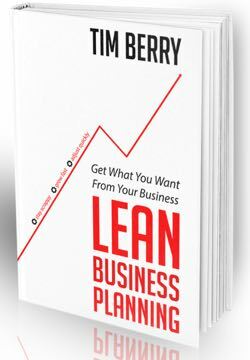 This chapter describes the principles of lean business planning. You might decide, as you read them, that they apply to all good business planning. I believe they do; but that’s up to you. Do Only What You’ll Use. Avoid waste. Go forward with small steps. Start with a lean plan and grow it only as needed for business circumstances. It’s a Continuous Process, Not Just a Plan. One plan is of very little use, but the lean business planning process is essential. Keep the plan small and review and revise often. It Assumes Constant Change. Lean business planning helps to manage change. You don’t plan on long timeframes and then stick to the plan regardless. Instead, your planning process helps to manage change. It Empowers Accountability. Lean business planning establishes specific responsibilities, dates, deadlines, activities, and performance metrics. The process includes tracking and following up to manage. It’s Planning Not Accounting. Financial projections are educated guesses, summarized and aggregated to optimize their use in decision making, tracking, and managing. They are not statements, but projections.